Detail : This hasn't been counted by me in the sequence of Paul McCartney single releases as it's not his release. 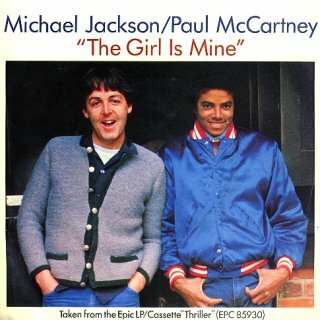 Credited to "Michael Jackson/Paul McCartney"
Paul spent three days in Westlake Studios, L.A. on April 14th, 15th and 16th 1982 to collaborate with Jacko on this track which will end up on Michael's album "Thriller". 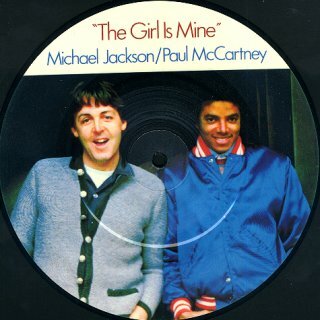 In reality this is a Michael Jackson release on his usual label with Paul assisting. 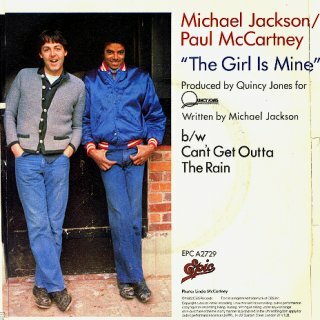 The song was written by Michael, but the vocals were shared between Michael and Paul evenly. Quincy Jones produced the recording although George Martin was allegedly present at the sessions. The B-side does NOT feature Paul. The single was released in a picture sleeve, and there was a 7" picture disc version (see below) printed with the same picture which was, of course, taken by Linda. The picture disc version is very rare, as it was issued only to chart return shops a couple of weeks after its initial release. Epic even denied it's existence for some time ! 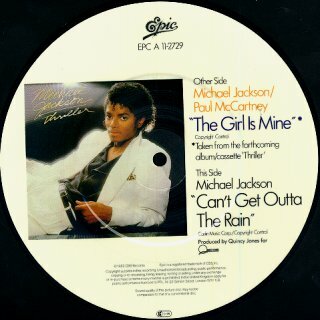 The single was re-issued on red vinyl (MJ 1-5) s part of a Michael Jackson nine single pack a year later on 25th November 1983.